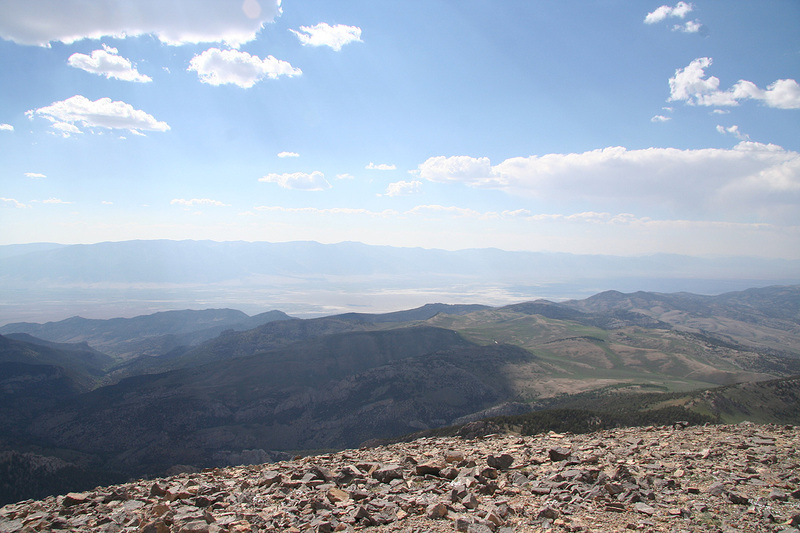 How to get there: The drive to this trailhead is quite nice and takes you across some of the best landscape you may find in the mountains of Nevada. Hwy. US-50 is a good starting reference. From the east, measure from the junction with Hwy. 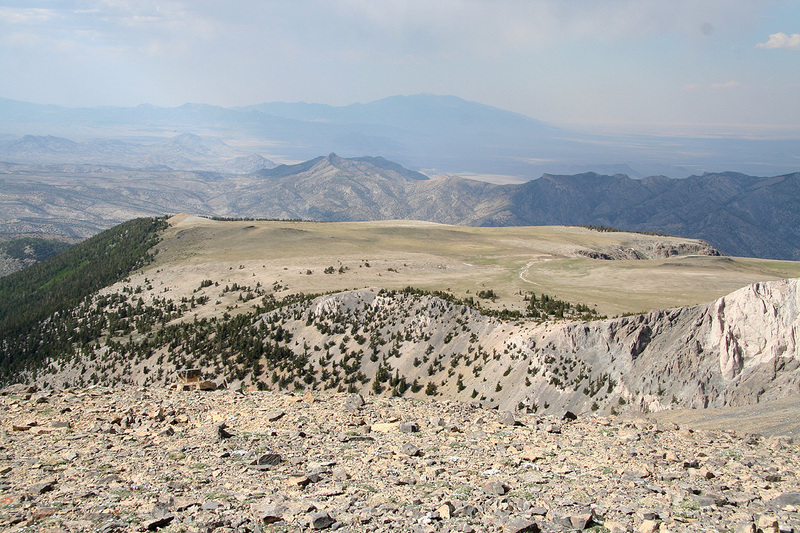 487, serving Baker and Great Basin National Park. Continue 14.3 miles west from here. From the west, drive approximately 42 miles east from Ely. More precisely, keep an eye on the (small) milepost markers along US-50. The side road is located between marker 80 and marker 81. This is a good dirt road going north in Spring Valley. It has a stop sign (for access to US-50), but no other sign. Measure from this turnoff. You will first drive about 15 minutes on a good dirt road, then one more hour on a road where a high clearance 4WD vehicle is recommended. The total distance from US-50 to this trailhead is 22.9 miles. First, cross 2 cattle guards and drive about 7.8 miles to a 4-way intersection. One road forks left, while two smaller roads forms a V-shaped fork going right. You should ignore all this and continue straight. At mile 11.7, you will approach cattle guard number 3. Before getting to it (about 30 meter), a road forks right. There is a sign identifying it as Forest Road number 469. 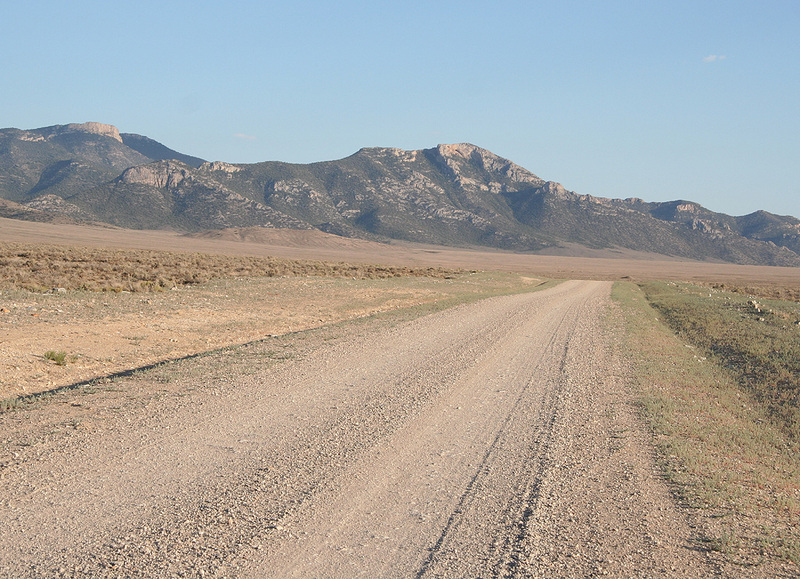 Take this road and embark on 11.2 miles of scenic driving. Measuring from this turnoff, first cross cattle guard number 4 at mile 2.9, then continue uphill with several hairpin curves to mile 5.9 and cattle guard number 5. You are now at the top of the hill. The road up here is fairly steep, but generally in good shape. Any high clearance car should be able to make it. At this point the road forks and you should keep right, there is another sign showing that you are still following Forest Road 469. Cross cattle guard number 6 at mile 7.7, then number 7 at mile 8.8. Continue by a small, green cabin on your right at mile 9.4. 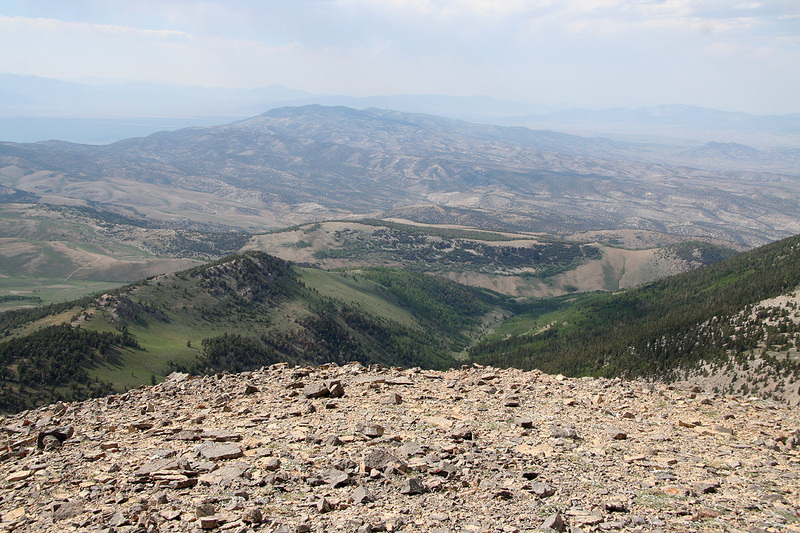 Go right in a road fork at mile 10.4, then arrive at a very clearly marked trailhead at mile 11.2 Park here, your location is N39:18.085, W114:12.690, elevation 3028 meter. 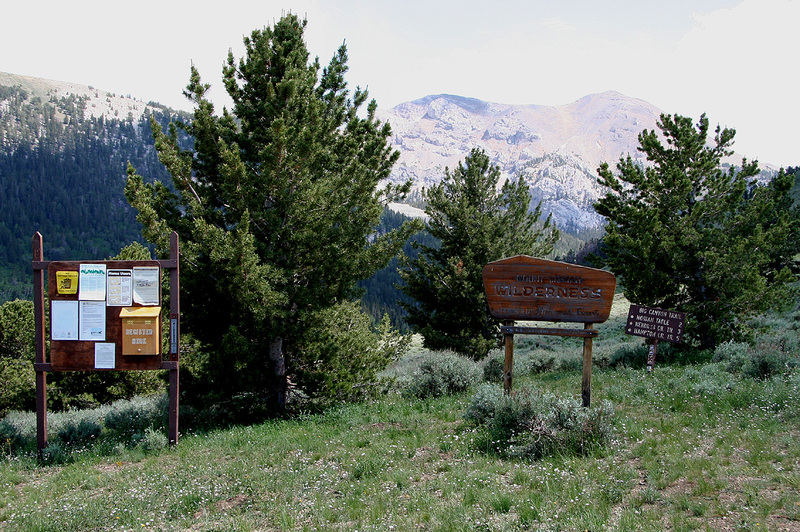 Route description: The trail leaves directly from the signs at the trailhead. You have a valley on your left. The trail runs parallel to this valley across some open fields, then gradually descends to the valley floor and eventually crosses the creek at the bottom. The trail continues a short stretch up along the valley, then climbs out on the left side and zig-zags up the side of the hill. 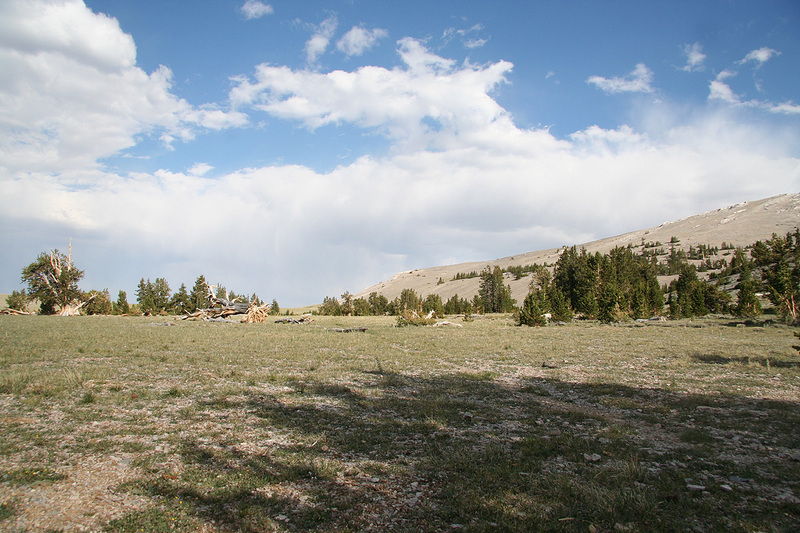 On top, you emerge onto a large, flat plateau called the Moriah Table. There are small clusters of bristle cone trees otherwise open grass. On your right, there is a small summit. Set course along an ascending traverse in order to reach the ridge line on the left side of this summit. 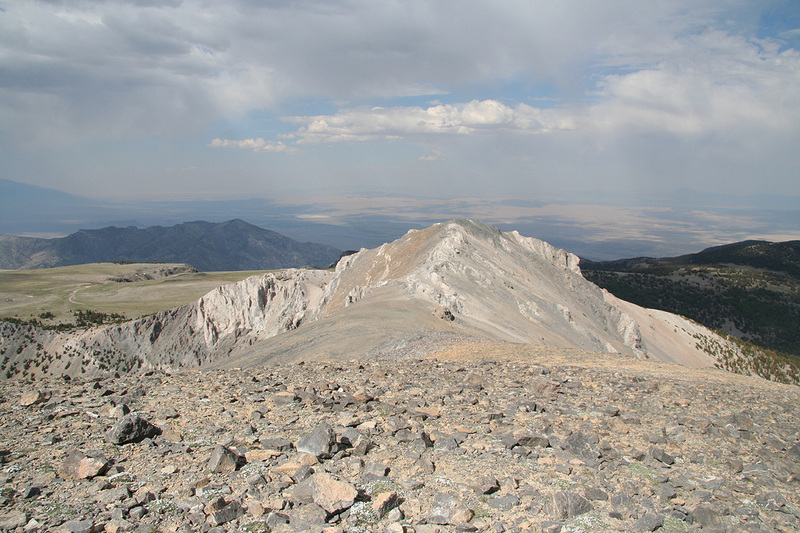 There is a col between this peak and the main ridge lkeading up to Moriah Mountain. 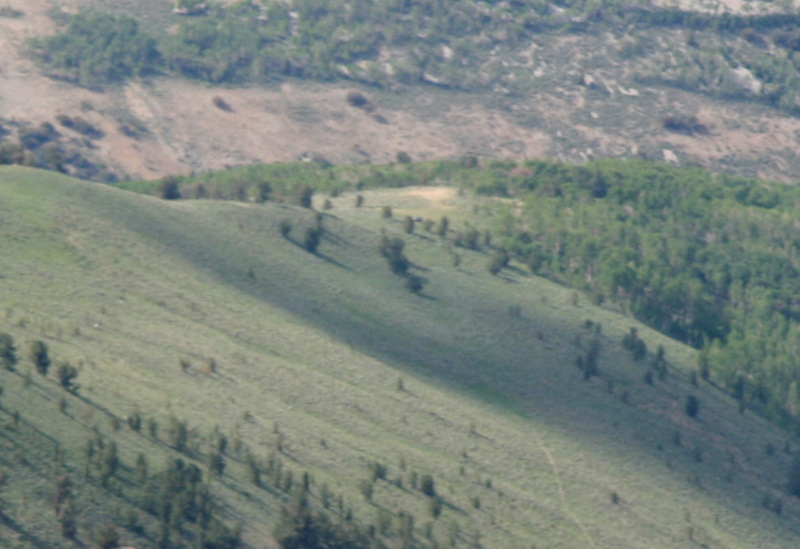 Thus, you will have to descend a bit on the other side of the ridgeline you are approaching. Therefore, there is little value in going too high, going way to the left will give a longer route. Pick your choice. 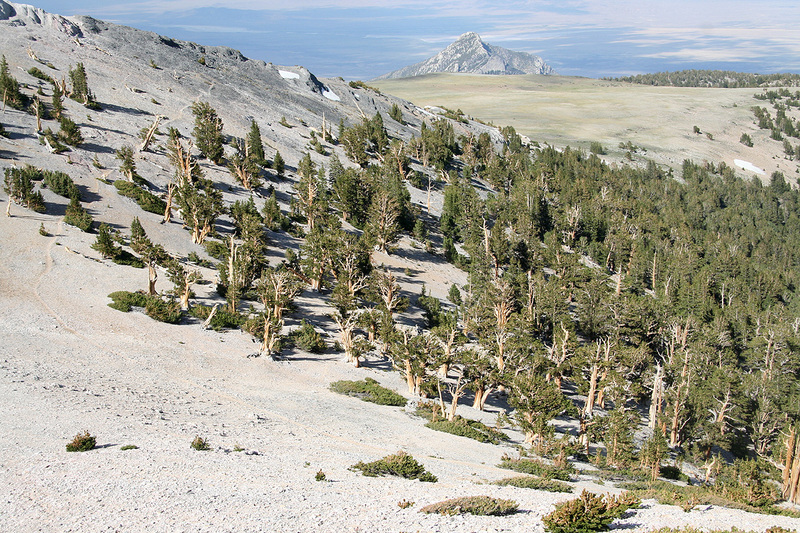 Descend back into the col separating Moriah Mountain from the small subsidiary peak that is directly connected to the Moriah Table area. (The picture is taken looking back from the col.) From here, there are two possible routes, a circular hike going clockwise is recommended. Ascend the mountain along a clear trail that traverses around on the east (left) side. 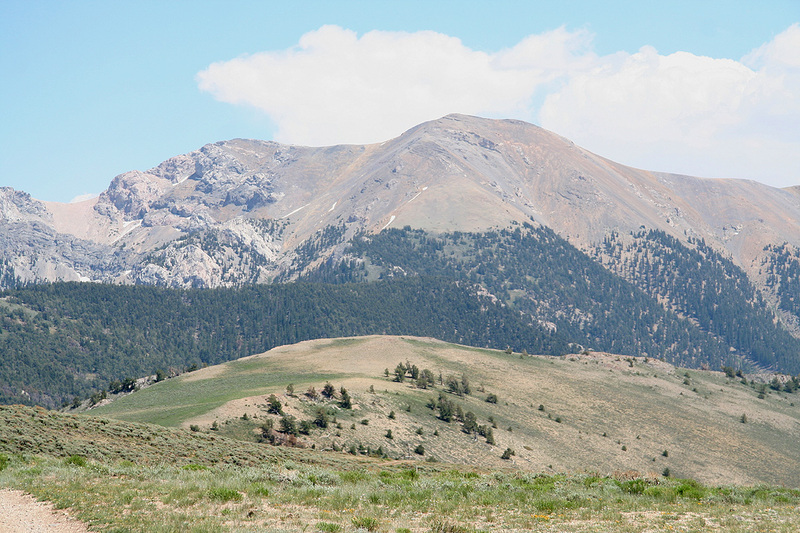 Further along, you may continue a pretty horizontal trail to the south side of the peak, then ascend or you may ascend right (no trail) and reach the saddle between Moriah Mountain and its subsidiary north peak. Either way, it is now obvious how to reach the summit. 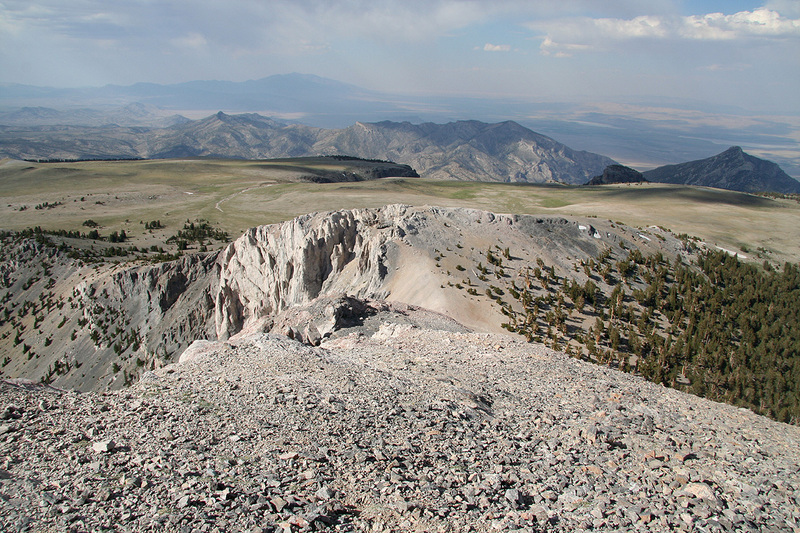 For the return, hike back down into the saddle to the north, then ascend the small, north summit along the top of the ridge. This is fun and never any dangerous. From this summit you can descend directly back to the col where you meet the other alternative. This last slope is pretty full of scree, easy downhill, a bit more difficult the other way. 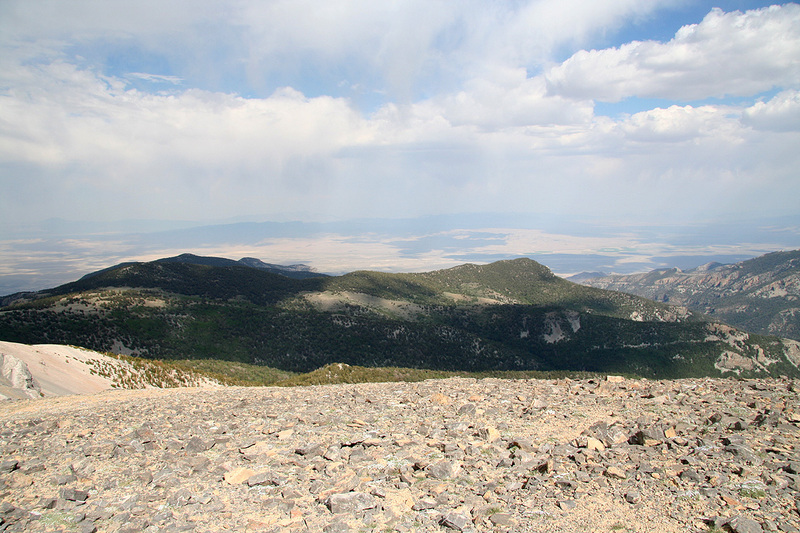 Comments: Having hiked Wheeler Peak early in the morning, it was indeed tempting to attempt Moriah Mountain in the afternoon. The drive to this trailhead is a small adventure in its own right. The road is pretty good, but a 4WD is recommended. 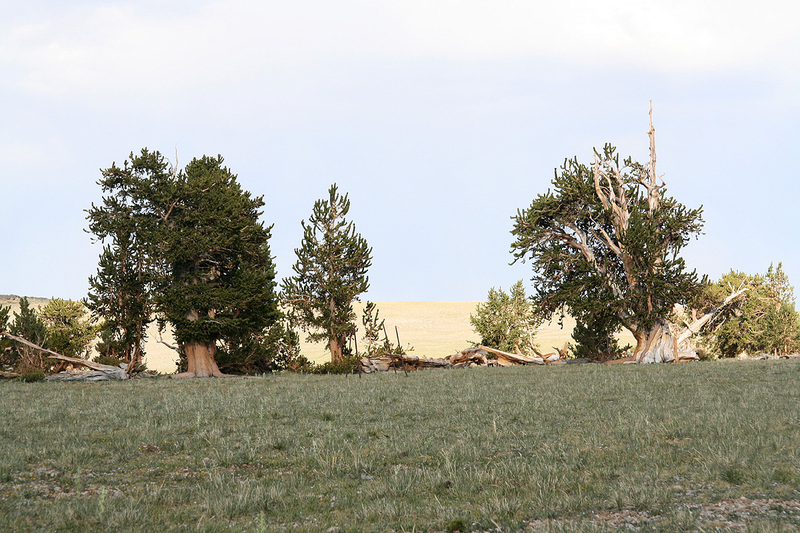 I came upon a sizeable herd of elk, unfortunately, they were rather shy as soon as they noticed the car. I had not expected anything quite like this and it took me time to get my camera in action. I parked at the trailhead around 1430 and was ready to go at 1440. The weather was nice and I felt well rested from the morning hike. This was again a very nice hike crossing a beautiful landscape. In particular, the Moriah Table is a type of landscape that is truly exceptional. 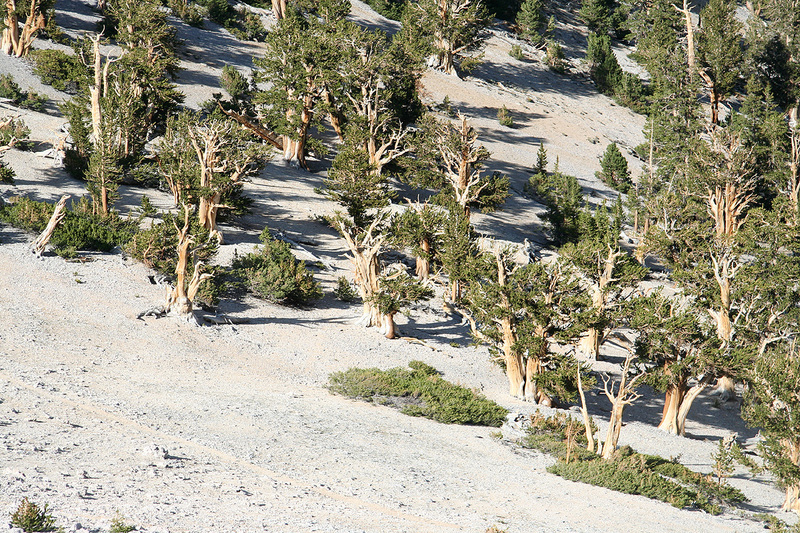 These old trees, that really look more dead than alive, they grow up here at 3000 meter elevation and suffer through pretty harsh conditions. 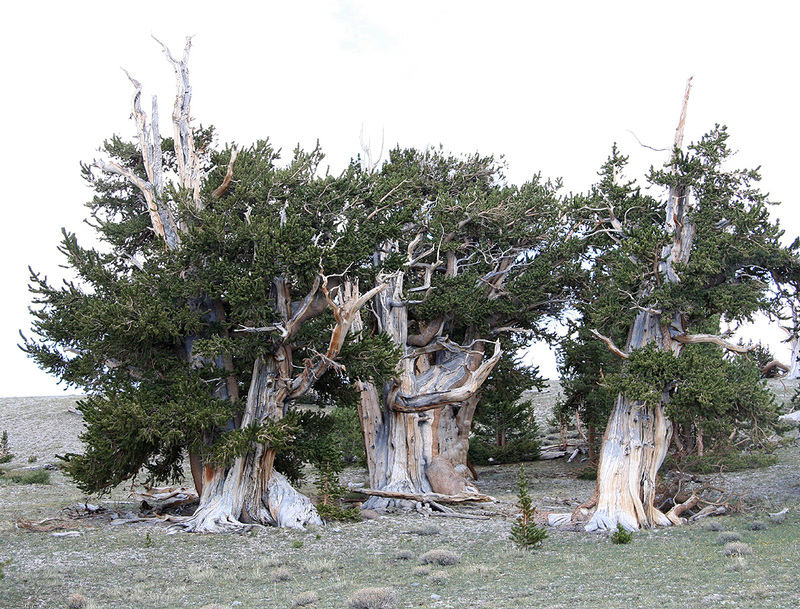 They are the oldest living thing known, some may be more than 4000 years old. I traversed across to Moriah Mountain and quickly ascended the final slopes, arriving at the summit before 1630. The weather looked a bit unstable, with rain and thunder possible from the east, in the west the weather looked much better. I therefore cut my summit stay to 10 minutes before returning across the ridge to the north summit, then directly back down to the col. The weather remained nice and a longer rest at the Moriah Table, an ideal place to just sit on an old tree trunk and look around on a most facinating landscape. 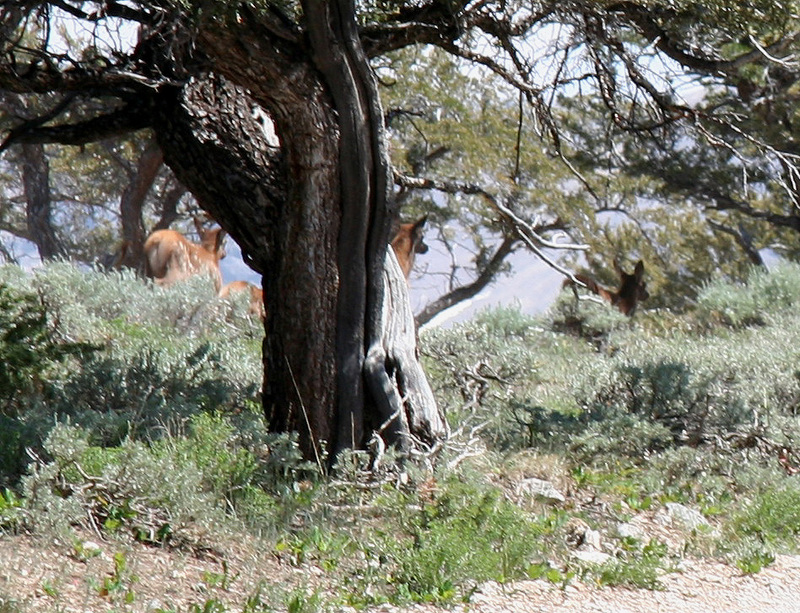 Later, when just starting the descent from the Moriah Table, a big red elk suddenly appeared on my left. He stopped and looked at me just as I stood completely motionless in order not to scare him. We looked at each other for perhaps 30 seconds, he then took off downslope with an impressive stride. Certainly a moment to be remembered and cherished. My return hike was easy and upon reaching my car at 1755, one of the best hikes so far had been concluded. 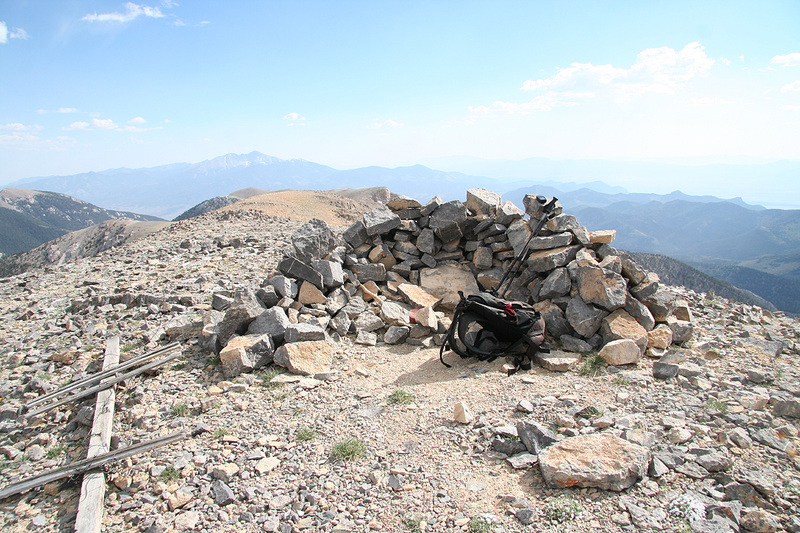 I now intended to drive to the trailhead for North Schell Peak and sleep there until the next day. 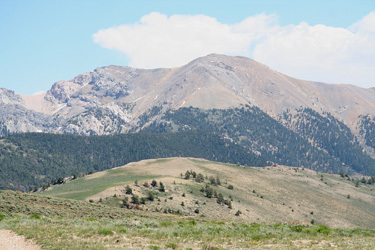 Moriah Mountain, as seen from the east. Moriah Mountain, as seen shortly before the trailhead. 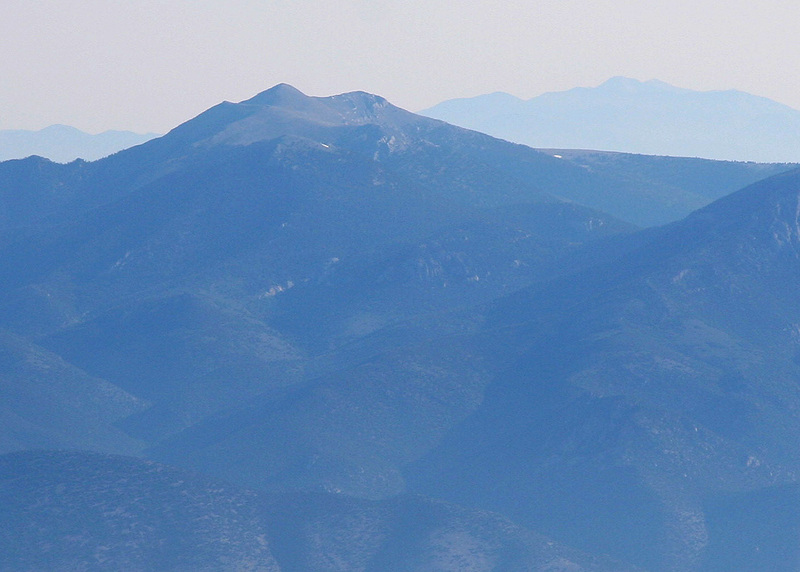 Summit view. The trailhead is just left of the closest valley. The trailhead, as seen from the summit. My car is visible.